It’s been nearly two weeks since E3 2017 has wrapped up and in many ways, I’m glad I’ve had the time to sit back and reflect on the dozens of games that I had the opportunity to experience on the show floor. Unlike playing something from the comfort of your home, trying out new titles (almost always for the first time) at a convention is a slightly more stressful scenario. Apart from not trying to embarrass yourself in front of PR personnel (as well as anybody else who’s passing by), you’re usually in a race against time, as you attempt to experience as much of a game as possible before it’s time to head to your next appointment. As a result, your first impressions might not be entirely accurate, and a few days go a long way when it comes to arranging and (in my case) writing your thoughts on a specific title. With all that out of the way, I can safely say that Super Mario Odyssey is not only one of the best Mario games I’ve played in years, but one of the best gaming experiences I’ve had in a long while. 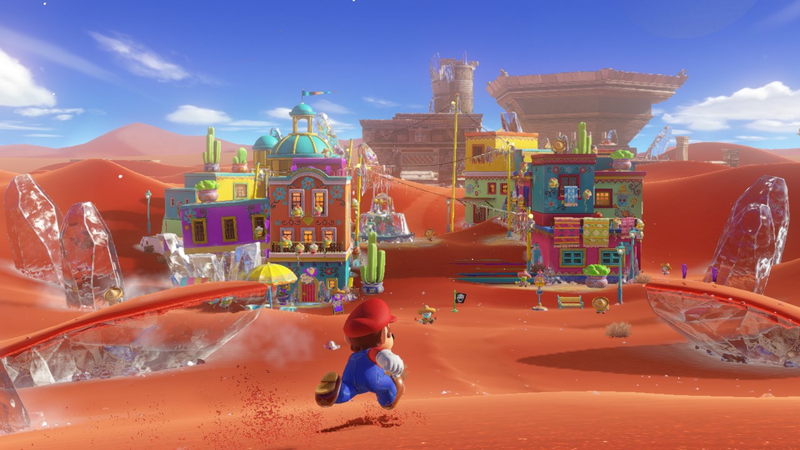 A lot of that has to do with the way the development team over at Nintendo EPD has crafted the numerous worlds which Mario is able to explore. Unlike the ‘open air’ design of The Legend of Zelda: Breath of the Wild, which features an unpacked world which players can explore at a more leisurely pace (and often not find anything of significance for extended periods of time), Super Mario Odyssey is a tightly-packed series of surprises and distractions. As you might expect from the master designers at Nintendo, while the levels (or more accurately, ‘Kingdoms’) are jam-packed with objectives to complete and secrets to explore, nothing ever feels crowded. We had the opportunity to go hands-on with the game for two demoes; one taking place in the busy streets New Donk City, and the other in a frozen desert. Impressively, each kingdom is laid out in a manner that I can only describe as “just right” (i.e., not too claustrophobic and overbearing, but not too sparse and without direction). The core gameplay of previous titles are ever-present (Mario moves as you’d expect him to, and you’ll be tracking down moons instead of stars this time around), but the biggest addition comes in the form of Mario’s newly-possessed hat, which houses a spirit aptly named Cappy. No longer a simple fashion statement, Mario can now toss his hat with ease, which can not only be used to dispatch enemies, but to “capture them” (Nintendo has gone out of their way to explain that Mario is not possessing his enemies), which allows you to take control of them. To the cynical gamers out there, this might come off as a gimmick, but it’s actually a very clever way to temporarily impart Mario with abilities that otherwise wouldn’t make sense for him to have. Need to fly over a large gap? ‘Capture’ a Bullet Bill. Need some more offensive power? ‘Capture’ a Hammer Bro. Mario can even take control of inanimate objects, such as power nodes (in order to zip across power lines). Cappy can also be thrown in a targeted direction, and if you can get a hang of the motion controls, Mario can spin Cappy around him, taking out enemies in an ever-expanding circle (while I didn’t get a chance to play with the Pro Controller, I was told that the game fully supports it, for those who prefer less handwaving while gaming). From its look to the way it handles, Super Mario Odyssey has the blueprints of a console game, but the pacing is more in line with the Switch’s versatility as a ‘hybrid’ system. Instead of tasking players with focusing on a single objective in order to collect one moon, Super Mario Odyssey adopts a more freeform style of progression. Moons can be obtained by completing small side quests, or through solving bite-sized environmental puzzles, as opposed to focusing in on a single objective. As a result, the game feels more improvisational and freewheeling, and it’s this sense of freedom that really shines, especially when compared to other entries in the series. I’ve only scratched the surface of what the game has to offer (unfortunately, my hands-on time did not feature Bowser, his plan to marry Peach, and his evil wedding planners who attempt to thwart Mario’s attempts to save the princess), but I can safely say that it is my most anticipated title for the year. To some, it might seem like “just another Mario game”, but Super Mario Odyssey marks a new era for the mustachioed plumber, one that isn’t afraid to reinvent itself where it deems fit. And for those who are itching to get their hands on the game, you won’t have to wait much longer. Super Mario Odyssey is set to release on October 27, exclusively for the Nintendo Switch.